Mara Hummingbird Stoneware Coffee Mug - just one of the many hummingbird designed mugs by Mara. The perfect gift for the bird enthusiast. 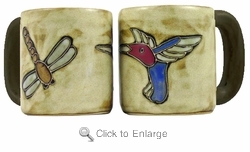 Check out all of Mara hummingbird designed products here Hummingbirds.